The Ministry of Energy and Water of Afghanistan has said that water loss across the country is forcing people out of rural areas and inflicting drought on farmland. Rapidly drying aqueducts mean there are progressively fewer sources of drinking water available, which is forcing people are dig up wells up to 250 meters deep. United Nations data show that in 2018, more than twenty provinces in Afghanistan have suffered or continue to experience the effects of drought. The UN estimates that 2.5 million people need assistance in the affected areas. Officials from the Ministry of Agriculture, Water and Rehabilitation on Monday have been summoned to parliament to address the drought, which it claims is the result of climate change, a global threat to which Afghanistan is proving increasingly vulnerable. Mujib Rahman Karimi, Minister of Rural Rehabilitation and Development (MRRD), told parliament that measures are being taken to restore agricultural resources. These include provisions of fodder and distribution and storage of wheat, and the creation of water dams and reservoirs. 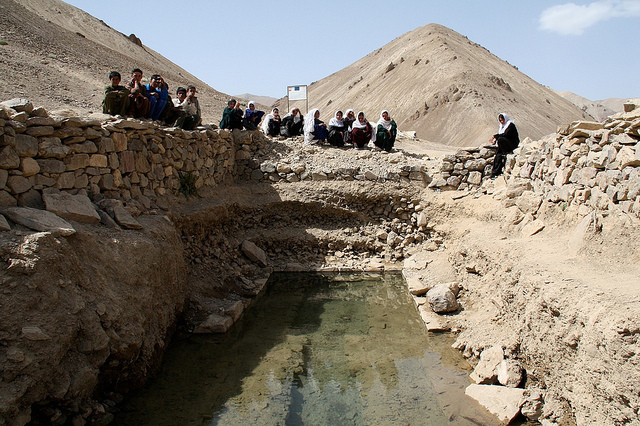 “As far as I know, we have [already] dug 768 semi-deep wells in different parts of Afghanistan,” said Karimi. Hashmat Ghafoor deputy Minister of Agriculture, Irrigation and Livestock, said all three ministries must devise plans that cover the next eight months, detailing procedures to roll out of emergency infrastructure in the case of a repeat drought in 2019. Afghanistan has experienced drought since 1995, when the Taliban, a fundamentalist militia, began seizing and occupying precious natural resources. Years of conflict has displaced populations that continue to live in poor conditions and depend on low incomes away from their farmlands. Agriculture has been especially affected by low levels of rain and snowfall, which has caused multiple annual crops to fail.